So Much Choice For Gluten Free! I had first heard of The Schooner a few months ago when a couple of my friends went there to try the Sunday Roast. 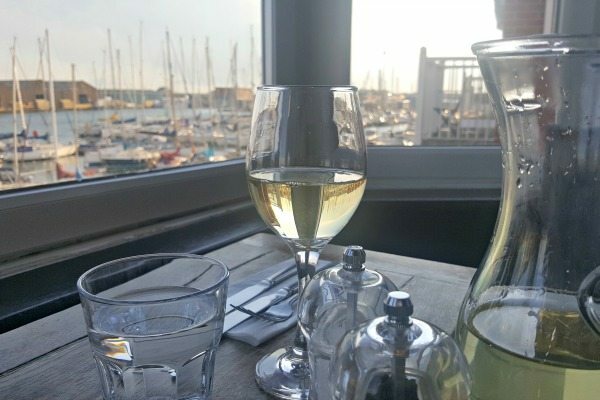 It is a lovely gastro pub situated by the Brighton port and lady bee marina, just past the Hove Lagoon and before you get to Shoreham. If you drive there is parking nearby, but otherwise it’s just a short walk from Southwick station, and the bus stop for the 700 stops just down the road. Neither my partner or I have a car in Brighton, so we jumped on the bus after work to head down there on a chilly, but very sunny afternoon. 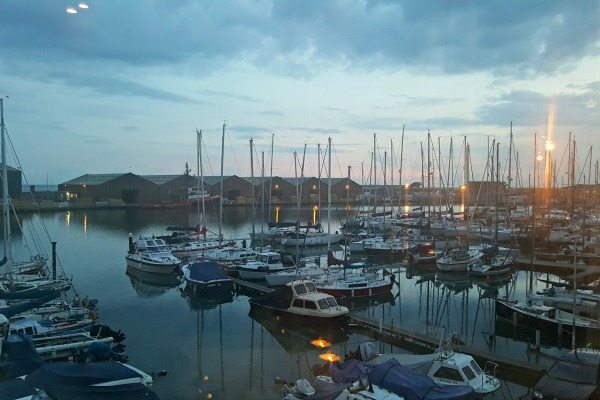 As we walked in we were greeted by the friendly bar staff, and shown to our seat by the window overlooking the boats moored to the jetty. 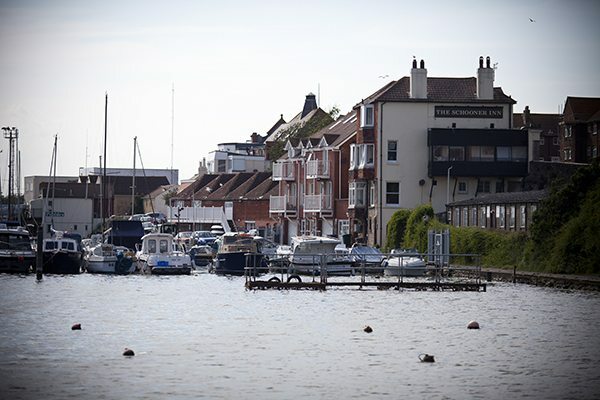 The pub’s interior is decorated with wooden tables, navy blue walls and pictures hanging throughout, and had the feeling of a sophisticated restaurant by the sea, but a warming touch with the traditional pub decor and inviting fireplace. 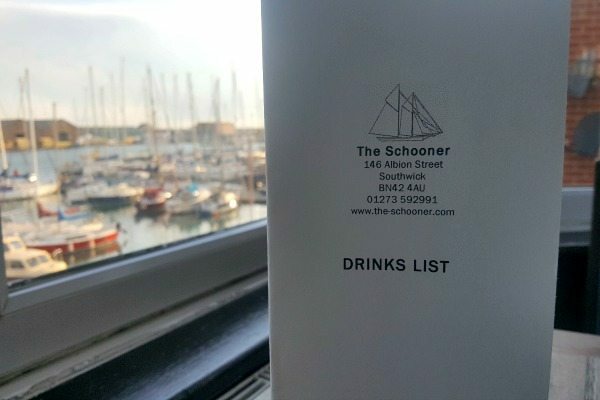 Recently the Schooner had revamped their menu to provide more gluten free friendly dishes and I was keen to check it out. The manager had said to me that they had had more and more demand for it, and realised it was easier than first thought to provide! They still use ingredients in their kitchen containing gluten, however they have got many dishes now on their menu that can be adapted to be made without non gluten containing ingredients so us gluten intolerants are spoilt for choice! We were offered a drink to start, and we both decided to share a carafe of wine. We chose the Poius White Rioja from Argentina that was lovely and crisp and not too sweet. It felt perfect to be enjoying on this sunny afternoon looking out over the sea. I mentally took note of the menu saying they do two of the same cocktails for £10, 7 days a week! They look lovely as well, and I will certainly have to try one next time we go. The menu is clearly labelled with the main dietary requirements making for easy ordering. They have a few labelled GFA, which means gluten free available, and they can just omit an ingredient if need be. We both decided to have a couple of starters to share start and then a main each, as I wanted to try everything! It all looked so good. 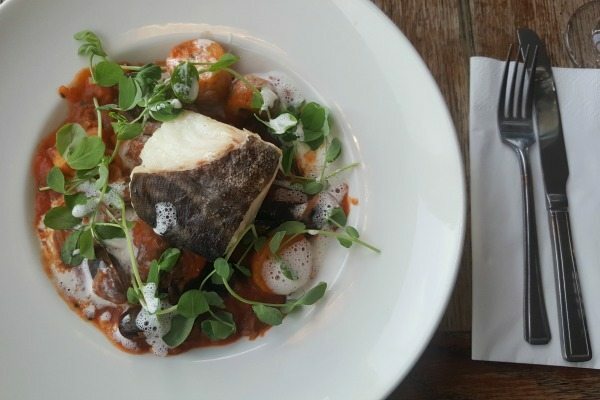 the Schooner use locally sourced, ethically reared ingredients as much as possible and the chef obviously knew his flavour combinations too. While we were waiting for our starters we were bought some bread for the table, and you will be pleased to hear they have gluten free bread too! 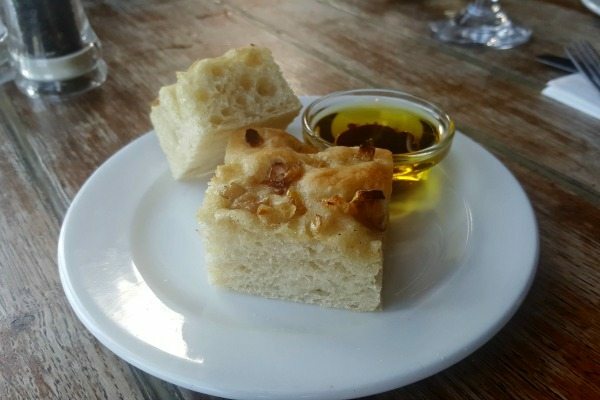 My partner had the regular homemade caramelised onion bread that looked and smelt divine, and the gluten free bread is ordered from one of their local suppliers and was soft and springy and delish. 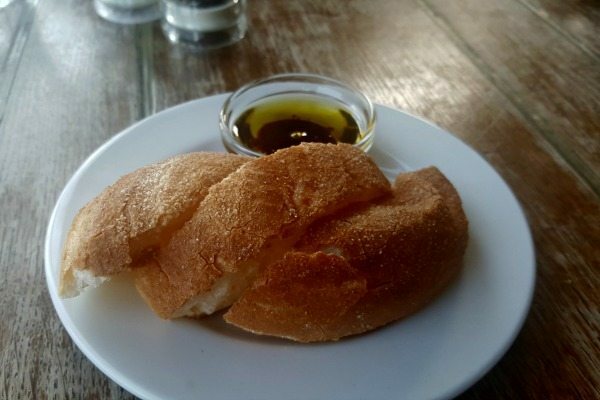 Both the breads were served with good quality olive oil and sweet balsamic vinegar for dipping. Our starters arrived smelling wonderful, and after quickly snapping our pics we dug in. 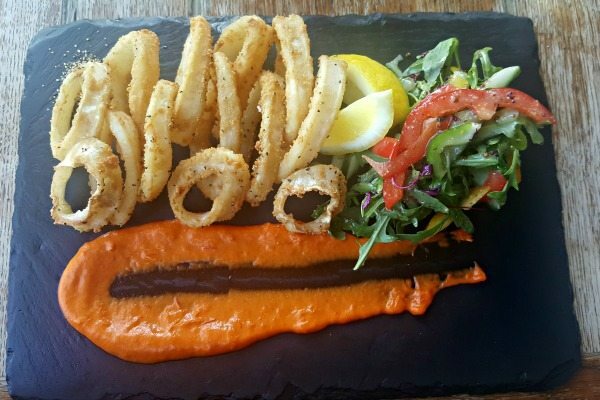 The first one we ordered was the gluten free version of the calamari, which they coated in seasoned almond flour and then deep fried until crisp. It was served with a roasted red pepper sauce on the side, that was sweet and bitter and rich, and then a small mixed salad and lemon. The calamari was perfectly cooked so not at all chewy! 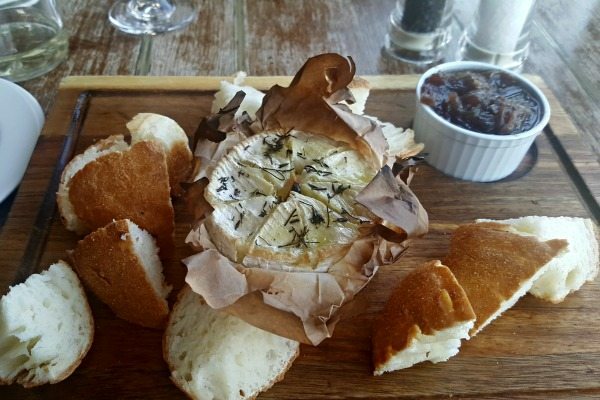 Our next starter was the baked Camembert with rosemary and garlic and was a real treat to be able to dip in with chunks of the warm gluten free bread. It was gooey and full of flavour, and served alongside a homemade sweet onion chutney. The pub had started to fill up now with many locals, but the service didn’t fault. If you are eating in the offer full table service, and even though there were only two staff working, all tables seemed to be being well looked and after and happily enjoying their food. It’s obvious a favourite among the locals and I can certainly see why! Our mains arrived promptly and also equally looked great, we were both excited to get dug in. I had chosen the gluten free version of the Portugese Salted Cod dish served with mussels, new potatoes and a caper and tomato sauce, and they had just omitted the chorizo which contains gluten to make it gluten free. The salted cod was just the right saltiness to not make it overpowering and was beautifully flaky so cooked the way it should be. The sauce was rich and tangy, and I loved the bursts of capers throughout, and the soft new potatoes were plentiful. I liked how the creamy foam and fresh pea shoots cut through the acidity, and I didn’t feel like I was missing out with not having the chorizo either. They definitely weren’t shy on the portion sizes making it great value for the quality of the food. My partner had opted for the non gluten free vegetarian falafel burger served with chunky homemade fries and coleslaw. 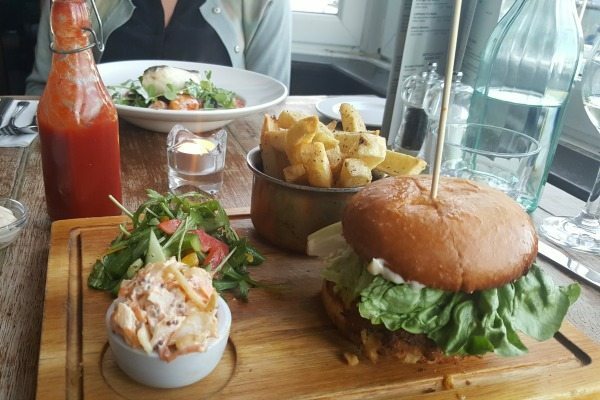 The burger was a giant patty served with the ingredients and spices used to make falafel, and was topped with goats cheese and tomato, and served in a soft brioche bun. Again another generous portion leaving my partners very happy! They offered him some homemade ketchup to go with his chips, and it was skilfully made and tasty. 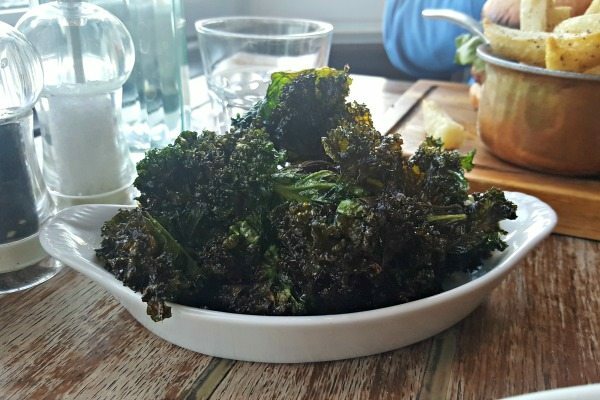 As a side we chose the crispy kale as it is something I could eat all day, and this was salty crunchy and more ish and despite the amount of food we had already eaten we both demolished the bowl. Now my sensible conscience wouldn’t have ordered dessert, but they had an irresistible GFA item on the menu that not even a full belly was going to stop me trying. Banoffee Eton Mess. That’s right. 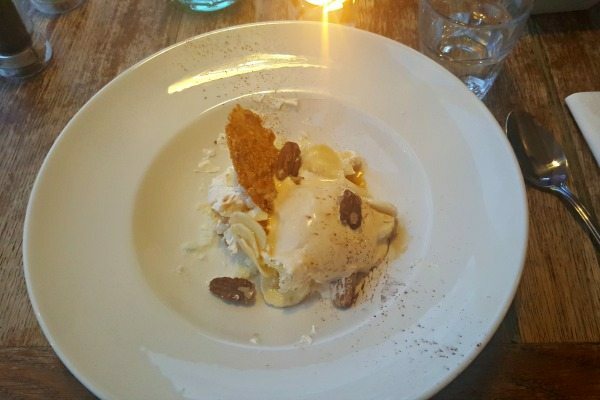 It was served with crunchy and chewy meringue, banana, toffee ice cream, honeycomb and caramel shards. On the menu it is served with waffles, but I was absolutely fine with my gluten free version bring it on! My partner wanted something sweet but light, l so went for the trio of icecream (also gluten free) that he said did the digestive trick. After a foodgasmic evening of delicious food, we thanked the friendly staff graciously and started to walk as far as we could home. The Schooner are doing wonderful things to their food and I would definitely recommend you head there soon for gluten free or non gluten free delights.